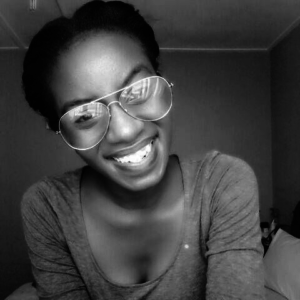 We are sharing this blog with you, written by Future Booi, one of our many Ikamvanites who wants to change the world. Help make her dreams possible by supporting her and other young people in our programme. My name is Future Booi and I am nineteen years old. I live with my single mother and sister, who is 21 years old. My goal and vision are to make a change in the world. There was a young girl whom I have chosen to name Lizzy, to protect her identity. She lived with her mother and grandmother. Lizzy had physical special needs and she was partially blind. Her mother abused her physically and I think this was due to her mother’s alcohol abuse. Lizzy cried every day and was sad most of the time. There were times they didn’t have food; my mother would give what she could as she knew Lizzy’s mother was unemployed and the odd jobs she was getting every now and then were not enough as she used some of it for drinking. The only person who tried by means to care for Lizzy was her grandmother who eventually died. The situation escalated when Lizzy’s mother passed on too, after some years. I still recall how difficult life was for her at that age. My mother was supportive, ensured she was safe and made sure her basic needs were met. My mother also took it upon herself to find Lizzy’s other relatives as she had been left all alone upon losing her mom and grandmother. Eventually, my mother was successful in tracking down her aunty. The day her aunt came to take her to live with her, was the last day I saw her. I vowed to myself that, I want to make a difference, to change the lives of other young girls, girls in my community, having witnessed Lizzy’s difficult childhood, I vowed to make a difference in young girls’ lives. To care for young girls who have been abused and abandoned by their parents. I would like to build a home for kids who have been abused, abandoned and/or orphaned. I want to make a change in their lives and give them hope. I would like for them to have a chance at rebuilding themselves, a chance to heal emotionally and this would require a specialized panel of counsellors and psychologists. I also believe in educating the young, I would also like to have their education fully funded, a guaranteed success for a bright future. They deserve to know their worth and for their dreams to come true. Today, these communities I live in are still facing the same problem of children being abused like Lizzy and they are too scared to speak about what they are going through. It might be because they don’t have a person they can trust and talk to about the situation and it could also be that they don’t know how to communicate their feelings. In our culture, it is so unfortunate that children are almost not allowed to voice their feelings and concerns and this is especially worse for girls because we are exposed to patriarchy. This makes it even harder when attending a government school that focuses only on academics and very minimal, if at all, on emotions and feelings. Girls nowadays are targets and they are easily attacked. This is what makes this goal relevant today. Young girls need to be protected and cared for. This goes beyond academics and education in general. Lizzy was young and naïve but I’m sure what she went through then still affects her now. And I cannot help but wonder if she ever got the help she needed in order for her to heal emotionally and physically, she endured so much abuse from her own mother. Presently in our society, there are many girls like Lizzy who are going through the same or are in a similar situation. I just hope that my goal becomes a reality, if it does not put an end to this terrible ordeal, I hope it inspires other women to come to the realization that we need to protect female children. Women abuse is a serious matter in South Africa and something must be done to stop this. Girls need to feel safe and they need to be loved not violated by men. We don’t deserve to be treated this way, we deserve better. Girls that share the same story, like Lizzy, are out there and they exist, they just need a person that is willing to help them heal emotionally and mentally. In order to make this work and make it possible, I think me studying psychology will help in making this dream possible and I believe that this scholarship will make my goal possible. I love being around people and I enjoy meeting new people. I was raised to respect both old and young. I am a God fearing young lady and very religious. I value education, I believe it is very important in one’s life. I respect and love myself and I appreciate the person I’ve become. I was born and raised in Uitenhage and I attended primary school there, I then moved to Cape Town in 2013 December to study at Ocean View Secondary. I am currently doing grade 12. My mother is a domestic worker. I believe I am unique and versatile. I am a strong young woman and I can take on any challenges that come my way. Most of all, I have been blessed with the gift of giving and this gift has been the main reason I have these goals and dreams I need to fulfil. In my upbringing, I witnessed struggles besides my own and at the time I was only nine years old and I could not do anything about it. These same struggles gave birth to my dream and changed the way of thinking and challenged me to become a better person in the world. 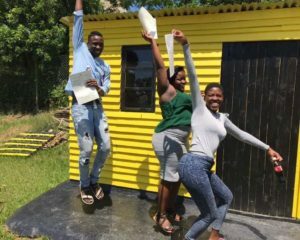 As access to tertiary is not the only challenge learners are faced with upon passing matric, IkamvaYouth strives to ensure that Ikamvanites secure funding to cover their tuition as well as other study related costs. IkamvaYouth was excited at announcement made by the former president last year, that free tertiary education would be phased in this year. Of the Ikamvanites who accessed tertiary, 50% have secured funding, mostly through NSFAS (39%). Aviwe Zono from the Makhaza branch who received an Asset Bursary to study Public Administration at CPUT. The Ikageng branch hosted its two annual flagship events, the 2018 Winter School (WS) took place from 25th to 29th of June, followed by the Matric Week camp on from the 9th to 14th July. The tutoring for these events mainly focused on challenging subjects such as mathematics, physical sciences, accounting, etc. This was to present learners with vital opportunities to get a better understanding of what they did not understand at school during the first half of the year. We would like to take this opportunity to thank our amazing volunteer tutors who demonstrated passion and dedication in helping our committed learners, diligently, throughout the process. Pre-Winter School Tutor Training – making sure all our tutors were equipped with important tutoring skills before the commencement of these two big events. The Current Grade 11’s Matric Induction – workshop for grade 11 learners on the prerequisites for tertiary enrolment and application procedures. Matric Applications Day – our grade 12 learners were hosted by the team of their mentors from North-West University to proceed with their post-matric applications, bursary and learnership research. Talent Show – a platform for the Ikamvanites to showcase their respective talents. Learner of the month – The award winner is selected based on good attendance and courteousness. Joy Olivier our Executive Director (ED) visited our branch to bid farewell and getting to know in person our new ED Lungile Zakwe. Thank you CCBSA for your continuous support in assisting us to provide quality programmes for our learners so that they may be able to have a bright future. From 2-6 July 2018, the IkamvaYouth Diepsloot branch hosted its first winter school programme. The week was successfully led by branch coordinator Sakhile Dubazana along with a group of tutors and other branch staff members who all showed great enthusiasm throughout the entire week-long programme. The winter school programme kicked off with tutor training on Saturday 30th June. This was an opportunity for the tutors to engage with each other through a series of activities that focused on how they can make this week the most effective for the learners. 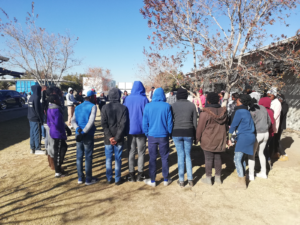 From Monday 2nd of July, we welcomed learners from different High schools around Diepsloot, who despite the winter cold were very eager and excited to be part of the programme to learn and prosper. 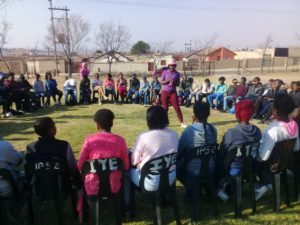 Each day, the learners started their day with a social activity while having tea and that was followed by quick icebreakers that are very fundamental into building social connections. The icebreakers were also an opportunity for the learners to bonds with the tutors. During the course of the winter school programme, the tutors were hands-on in all the subjects that they were assisting with. All the learners from grades 10-12 were engaged in the work that they were doing and their curiosity was really evidence of their willingness to learn and engage with the content. The mathematics learners also took part in a math Olympiad. The winter school programme also included a career expo day. We invited different experts in different fields to come and address the learners in a session that was very informative and valuable to all learners, particularly the matriculants preparing for their post-matric life next year. On the last day, we had a thought-provoking debate session which was facilitated by the English tutors. Learners were really engaged in the various discussions that emerged as they debated about issues that affect the youth on a daily basis. Finally, we closed off the week with a talent show and the learners showcased the potential that they have outside the classroom environment. The following week was focused on the matriculants, helping them complete their online University applications. As part of the process, the learners participated in the regional Gauteng Matric Applications day at the University of Johannesburg. This day involved a career guidance and mentoring session, led by one of the lectures on how can students effectively prepare themselves for University and what to expect when they have finally made it there. Thereafter, the learners were given access to a computer lab and were assisted with tertiary applications. The day ended with a campus tour. 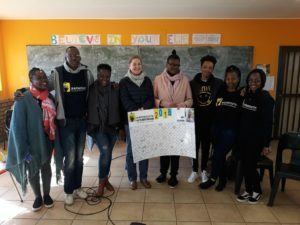 Massive gratitude to the Mamelodi team; Neo, Tokelo, and Obakeng (tutor); Lerato from Ivory Park and Masego (Ebony Park tutor), whom after their own week-long winter school came to support our branch. Siyabulela! We experienced real teamwork, collaboration, and peer-to-peer support.